The tragedy is chronological Rawagedeh the Dutch army massacre in 1947 when the first Dutch military aggression that resulted in about 430 - Rawagedeh's population died. The families tried to ask for justice due to the Court treated the Dutch Netherlands, and without thought to their lawsuit in a local court granted, of course it is encouraging the families of victims because the business has been finally able to get a little taste of justice. Many people who do not know really what and how events Rawagede Massacre Historical Tragedy. We try to provide some information about this event.Chronology History of Tragedy Massacre is massacre murder Rawagede Rawagede Village (located in the Village Balongsari, Rawamerta, Falkirk) is located between Karachi and Jakarta by the Dutch army when his first military aggression on December 9, 1947. 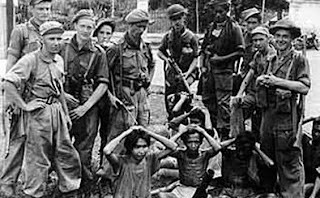 As a result of these events as much as 431 people died.Before the Renville agreement is signed, the Dutch Army joined in Division one or Division also called December 7 to do the cleaning unit of troops and Indonesian freedom fighters who fought against the Dutch. In the area of ​​operations in Karachi, the Dutch army is hunting down the Captain Luke Kustario Siliwangi which is the Company Commander and Battalion Commander also became Tajimalela / Brigade Siliwangi Division II. He repeatedly and successfully attacked the patrol Dutch military posts. Also in this region also Rawagede many Indonesian soldiers and fighters. On December 9, 1947, one day after the negotiating Renville. Dutch soldiers surrounded the village and searched every house Rawagede. But they did not find any guns there. Then the Dutch army is gathering all the inhabitants in the open field. Male population was told to line up, and asked where the fighters and the Indonesian Army. Tentapi none of the residents who say their existence.Then due to the silence of the population, the leader of the Dutch soldiers ordered to shoot to death the whole male population, both old and adolescents. Some people managed to escape to the forest, although many are hurt badly because of exposed tempakan. Dutch soldiers shot dead by strafe with a machine gun without mercy. Because the event was around 431 people were killed Rawagede. Actually, the death toll of more than 431, because many corpses are swept away into the river due to flooding and heavy rain.The next day the Dutch troops left the village. The women who are still alive to bury the bodies of the male population with simple equipment. Since it is not able to dig too deep, the body covered with pieces of wood and some use the leaves of the door and then the soil covering, potluck, consequently still smell the smell of dead bodies for several days.Furthermore, many multiple versions and chronology of the history of this tragedy Rawagede massacre. Then to the death toll is still being debated many historians. Regarding the number of deaths, some sources refer to different numbers. According to the book De Excessennota, Dutch soldiers executed approximately 20 residents, the total number of victims killed during the operation 150 inhabitants. While on a stone memorial in the Heroes Cemetery Sampurnaraga, the death toll in Rawagede on December 9, 1947 was 431 souls. The old mother occasionally blinked and rubbed his eyes with a rag that held in the left hand. Sitting jostling with other mothers peer under the hood with the scorching sun blinding did not make her feel anxious or feel like to go home shelter at home.He just looked straight ahead, toward the podium rather, where the Regent Falkirk, West Java Province, Ade Voice gave a short speech and then followed by the Netherlands Ambassador to Indonesia, Tjeerd de Zwaan. Then her eyes filled with tears. "I was pregnant three months when she saw her husband was shot by Dutch troops," Wanti (85 years), the mother of old, who began to talk. "Initially all the men were ordered out of the house, and told to march. Keep their head shot with a rifle Dutch troops, only women and children who escaped," he said, wiping tears with a rag in her hand.Wanti told after the shooting that took place that morning, he and other mothers began looking for the bodies to their husbands. Armed with sophisticated tools, the remaining villagers started digging the ground to bury the bodies of their families. Because it uses simple tools and a hole dug well is not deep, then smelled the smell of dead bodies for days in the village.Wanti is one of six people from the village of Rawagede widow who demanded the Dutch government for the massacre that occurred on December 9, 1947, or when the Dutch military aggression to Indonesia after the archipelago declared independence in 1945.In the area of ​​operations in Karachi, the Dutch army captain Luke Kustario actual hunt, Siliwangi Company Commander who was with his troops to attack the Dutch army known cunning. Luke believed to be hiding in Kampung Rawagede.Told, because they do not find Captain Luke, then the Dutch army ordered all the male population, including teenagers in the village were lined up and strafe them with machine guns. An estimated 431 people have died from the shooting.Years later, a veteran Dutch soldiers who do not want to be named from the village of Wamel, a village in the province Gerderland, East Netherlands, sent a letter to the victims of the tragedy Rawagede contents as follows:"From the Swamp Gedeh Dutch troops were fired upon. So it was decided to beat up the village to be a lesson for lain.Saat villages surrounded Gedeh Swamp night. Those who try to leave the village, killed without sound (attack, pressed into the water until it sinks; their head was hit with rifle butts, etc.) Hour and a half six in the morning, when it began to noon, the village fired on with mortars. Men, women and children who would otherwise escape should be killed: all of them were shot dead. After the village was burned, the Dutch troops occupied the region . The villagers are left then collected, squat, with hands folded behind his neck. Only a few are left. Holland Marsh assume Gedeh has received pelajarannya.Semua man shot dead by Army troops, called the Kingdom. All the women were shot dead, while the Dutch state democratically. All the children were shot dead ".Dutch ApologizesSince 2006, a group calling itself the National Committee for Dignity Nations Defenders Indonesia (KNPMBI) together with the widows, victims and witnesses of the massacre in Rawagede demanded an apology and compensation from the Government of the Netherlands. Liesbeth Zegveld of the law firm Böhler became their lawyer.On 14 September 2011, the Court of The Hague Dutch government declared guilty, and must be responsible. The Dutch government was ordered to pay compensation to victims and their families. According to the victim's attorney, the amount of compensation per person by 20 thousand euros, or about Rp240 million.Finally, when tragedy Rawagede 64-year anniversary on Friday (December 9, 2011), the Dutch ambassador to Indonesia, Tjeerd De Zwaan said on behalf of the government's apology to victims of tragedy Rawagede. "Today we commemorate the Village Balongsari family members who died 64 years ago when the Dutch military aggression. I on behalf of the Dutch government apologizes for the tragedy," said the Dutch ambassador to Indonesia, Tjeerd de Zwaan during the commemoration of 64 years following the massacre Rawagede Tragedy Balongsari Village on Friday.Zwaan said Rawagede event is a sad thing and a striking example of how the relationship between Indonesia and the Netherlands at that time (in 1947) running in the wrong direction. "Each of you must have its own way to cope with bitter memories of the tragedy Rawagede. I hope that by reflecting together on the event, we can move together into the future and work together closely and productively," said Zwaan.Towards the door Other CasesDefenders of the National Committee General Chairman of Indonesian Dignity (KNPMBI) Batara R Hutagalung said besides the tragedy of the massacre in the village Rawagede (West Java), which killed 431 civilians, there are still many cases of other massacres committed during the military aggression Dutch army in Indonesia in 1945-1950 . "In South Sulawesi province, malignancy Dutch army under the leadership of Raymond" Turk "Westerling conducted in December 1946 claimed 40,000 lives," said Batara.Batara said Westerling and his deeds, especially the army that massacred villagers galung Lombok and surrounding villages can escape from the demands of human rights violations because the actual terror acts are called "contra-guerilla", get "license to kill" (license to kill) from Lieutenant General Spoor and Deputy Governor-General Dr. van Mook, for fear of resistance against the occupation army masyarakatlokal Netherlands. "So who is actually responsible for the massacre of the people of South Sulawesi is the Government and the Dutch Armed Forces," he said.In addition to an investigation into the massacre in South Sulawesi, Batara also urged the Dutch government de jure recognize the independence of the Republic of Indonesia official date ie August 17, 1945. "From the point of history, which is recognized by the Dutch government of the Republic of Indonesia States on December 27, 1949. It was disbanded on 16 August 1950 and August 17, 1950 restated the founding of the Republic of Indonesia. Now the Dutch government has diplomatic relations with the Republic of Indonesia . So if it is not recognized as well, I think it's been so violated diplomatic etiquette, "he said.According to him, the Dutch may have a dilemma to recognize Indonesia's independence date for when this happens, it means the country's military aggression in the archipelago that occurred between 1945 to 1950 was the attack on a sovereign state. "Indonesia can only sue the Netherlands for war crimes during the five years and the party responsible for all crimes that could be submitted to the International Court," he said. Recently circulated a recent book written by Peter Schumacher the title 'Ogenblikken genezing van, van de geweldadige dekolonisatie Indonesie'. Translation: The moments of healing, violence in the process of decolonization in Indonesia '. Here's his explanation why he used the term 'genezing' or healing.Peter Schumacher: "That quote from the statement of a correspondent of the Netherlands, Henk van Maurik, who got an assignment to cover the 'Politionele Actie'. He was also wanted to know the mindset of the Indonesian side. "Henk van Maurik new understanding of why there is so much violence and especially the attitude of Indonesia, when it gets a chance to speak with a freedom fighter in South Sulawesi. He called the occasion as 'ogenblikken van genezing'. And the naming of Peter Schumacher borrowed for the title of his book.Although it sounds a bit hesitant at first, Peter Schumacher is currently assessing the Netherlands had recovered from the melee stance and injured in the process of decolonization. Decolonization period of 60 years ago, are long gone. Now, my own knowledge about it and expanded my understanding of the process the better.Peter Scvhumacher: "The process has been almost forgotten. All this has been born two or three new generations. Many of them can practically do not even know exactly where Indonesia again. "Thus, in the end, Peter Schumacher agreed that the Dutch had recovered from the trauma of decolonization.War CriminalsIn matters relating to acts of violence or murder during the war, the Dutch knew of two terms: 'oorlogmisdaad' or war crimes and 'exces' or excesses.Peter Schumacher: "Different 'oorlogmisdaad' with 'exces' is: 'oorlogmisdaad' knowingly executes, as adopted by the Germans and Russians. "According to Peter Schumacher is currently difficult to accept such war crimes. But things like that, in the decolonization process, occurring in Indonesia. Being 'exces' is a conflict that goes out of control. With the result, more victims fall that could have been avoided. And this also happens in Indonesia. Peter Schumacher assess what oeh Captain Raymond Westerling in South Sulawesi, and the case of the massacre in Rawagede is a war crime.ExpiryDutch government and the courts judge cases of war crimes committed by the Dutch army in Indonesia has expired. According to Peter Schumacher is more a matter of law.Peter Schumacher: "Of this there are two ordinances, issued by the Dutch and Indonesia, in 1949. "Two ordinance shall contain provisions to the Dutch and Indonesia will not be questioned anymore violations. So, it is an agreement of both parties.Now there are those who try to bring up this issue, and trying to demand compensation, while the Dutch government declared this case had expired. According to Peter Schumacher himself, cases like this can not be raised again brought up, because, in the past to the two sides have stated this will not bring up the subject again.Sorry StatementNow the Netherlands has admitted that the process of decolonization occurred many war crimes committed by their military forces in Indonesia.However, about whether or not the Dutch formally filed apology in Indonesia, Peter Schumacher somewhat ambivalent attitude. On the one hand, he declared, of course, it's something that can still be done by the Dutch. The problem is, if this is done, and then used as the basis of legal arguments by the parties that demanded in return for compensation, the impact will extend much further.Peter Schumacher: "The parties in the Netherlands could also claim damages in Indonesia, because they were also deliberately killed many Dutch people. "Thus, if the Indonesian side should also ask Sorry? After all, if the Dutch proposed apology, it will open up opportunities for many parties in the Netherlands to also put forward similar demands on the part of Indonesia. And this, again affairs to legal experts.The interest in IndonesiaTo the question, why, interest parties in Indonesia in matters related to the decolonization process is minimal?Peter Schumacher: "What is clear, the Indonesian side emerged victorious war. Also in the matter of West Irian, Indonesia won. Furthermore, the Indonesia more preoccupied with the affairs of everyday life. "For many people of Indonesia, this issue is really the history of the past. Maybe this is interesting for a handful of historians. Interest in temporary quarters in the Netherlands during the decolonization mainly because of feelings of guilt, about the past. And it may also be the cause of differences in attitudes among the public in the Netherlands and in Indonesia.An Anonymous Letter From butcher RawagedeAn anonymous letter reached the hands of Dutch Honorary Debts Committee (KUKB) in the Netherlands. The letter was not delivered by mail, but given someone who claimed to receive from a war veteran. Its contents show a sketch of regret a Dutch soldier who allegedly participated in the killing of Rawagede.Swamp Wamel GedehI can not mention my name, but I can tell you what really happened in the village of SWAMP Gedeh.You know, between the years 1945 - 1949, we tried to retake our colonies in Southeast Asia. For that from 1945 to 1949, about 130,000 Dutch soldiers were sent to the former Dutch East Indies, now Indonesia. There occurs the following:In West Java, east of Batavia, in the area Krawang, there is the village of Rawa Gedeh. From the Swamp Gedeh Dutch troops were fired upon. So it was decided to beat up the village to be a lesson to other villages.Gedeh Swamp at night surrounded. Those who tried to leave the village, killed without sound (attack, pressed into the water until it sinks; their head was hit with rifle butts, etc. )At half six in the morning, when it began to noon, the village with mortar fire. Men, women and children who would otherwise escape should be killed: all of them were shot dead. Hundreds of them.After the village was burned, the Dutch troops occupied the region. The remaining villagers were then gathered, squat, with hands folded behind his neck. Only a few left. Swamp Gedeh has received the 'lesson'.All the men were shot to death - even though we named 'Royal Army'.All the women were shot to death - even though we come from democratic countries.All children were shot to death - even though we are Christian soldiers mengakunya advent Week 1947.Now I remembered Swamp Gedeh day and night, and it makes my head hurt and my tears burned my eyes, especially when I think of the children whose arms are too short to fold his hands behind his neck, and their eyes widened, fear and do not understand.I can not mention my name, because this information is not favored certain circles.But perhaps of Wamel, instead of Wamel, will appear initiative. I do not know how.